omg omg omg! 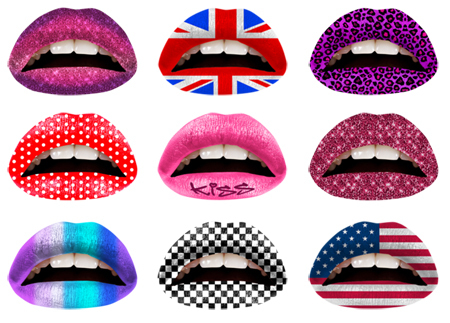 the tacky chick in me nearly wet her pants when she saw these temporary lip tattoos. here are a few examples, but you can shop the range from the link above. they also have a nifty web-based app that lets you snap a webcam photo (or upload one, whichever) and “try on” the tattoos before you buy so that you’ll have an idea of how they’ll look on you. best of all, they’re made in the USA. This entry was posted in fashion, makeup and tagged lip tattoos, lips, temporary tattoos, violent lips. Bookmark the permalink. i included the purple cheetah ones just for you auntie!